Or at least, a replica of it does. What better way to scare the living bejesus out of guests than to have them put their drinks down on a coffee table with the body of Jason peering back out at them? 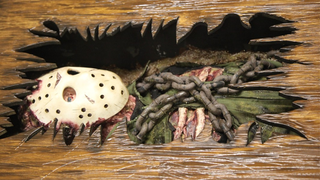 The table is made by Australian company Slaughter FX, and goes the whole nine yards into making the replica of Jason's body - based on seventh movie in the franchise, New Blood - which includes crepe paper hair, a latex ribcage and even clumps of hobby dirt to make it look extra gross. Delightful! Aside from the less-than-subtle giant body the table houses, machetes and replicas of Jason's mask adorn each side of the table too, just so people really know that you really like Friday the 13th. Although Slaughter are currently out of stock of the table, you can ask them to create a custom-built version through their website — with a glass topper, it costs roughly $600, or $500 without... thus turning it into a very cool and creepy, yet largely useless table. Unless you want to start precariously balancing your mugs and other knick knacks on Jason's decaying face. Feel free to do as you please with your corpse table!